Curds and Wine is your Experience - Education - Entertainment headquarters for all of your winemaking and cheese making needs! We'll guide you in choosing the best yeasts for your fermentations, as well as other ingredients to make the best wines from your grapes. 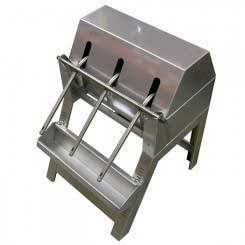 We also have equipment for rent to crush and press your wines. We do some basic in-house wine chemistry testing, but for more in-depth analysis our friends at Vinmetrica offer a wider array of tests. See our red wine making summary and basic shopping list available online to help you find everything you need for your fermentations. In association with San Diego Amateur Winemakers' Society, Curds and Wine will be hosting bi-monthly home winemakers' seminars. These seminars are held every even numbered month on the third weekendat 1 pm. Seminars are given by Lum Eisenman, a winemaking guru that we are lucky to have in the San Diego area. Lum will share his expertise on various winemaking techniques and issues. This month, just in time for harvest season, Lum will discuss "Must Adjustments". We are here to help you get some fresh grapes for your home winemaking this harvest season! We will once again be a pick-up point for fresh grapes from West Coast Grapes, grape varietal availability and pricing for 2014 will be online soon -- sign up to get notified when it is available. Grapes are purchased directly through West Coast Grapes, we are a pick-up point only, no sales on site for these grapes! Please note, we cannot store these grapes, they will start spontaneously fermenting if you do not pick them up the day they arrive. We are anticipating a late September delivery; if you order grapes online from West Coast Grapes they will send you an email when the exact delivery date is set, or check our Facebook page for updates. 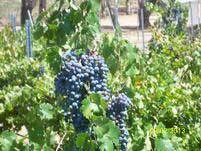 Harvest time is approaching -- time to get your crushpad ready! Curds and Wine has a limited selection of large equipment for sale this year, including manual or motorized crusher/destemmers and stands (sold separately), basket or bladder presses, and stainless steel tanks. 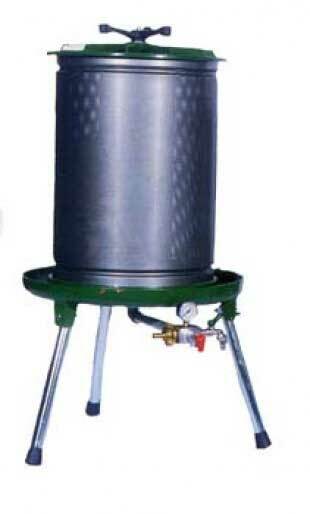 We also have a few 3-spout and 5-spout gravity bottle fillers. Keep your summer sips perfectly chilled with the Host Freeze Cooling Wine Glasses. Pop them in the freezer to keep your whites cool for hours, or store them in the refrigerator to keep your reds at perfect serving temperature - hot red wine is not so hot! 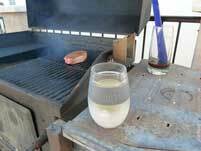 These glasses are great, perfect for summer sipping at the grill or chillin' at the pool. Get yours today from Curds and Wine! Contact us if you are looking for grapes for sale. We typically get information as grapes are ready to harvest, you might only have a few days notice. Often you will pick your own, and don't forget to check if they have a crusher/destemmer or if you will need to rent one from us. If you need to rent one from us please contact us as soon as you know your harvest date -- the crusher is very popular during harvest season and availability is not guaranteed without a reservation. We also of course have all of your harvest supplies and yeasts available a well as other equipment rentals, such as pumps and presses. Cider House Select is a complete ingredient kit with everything* you need to craft the best cider. These 6 gallon recipes are deliciously packed full of flavor and perfect for any level of experience. Whether you're looking for an ice cold, refreshing drink during the hot summer months or looking to warm up during the cooler autumn and winter, Cider House Select ciders are a perfect choice for anytime of the year. With eight mouth-watering flavors to choose from you will have no problem finding one that's perfect for you! See all of our cider kits available online. *If you would like to make any of the Cider House Select ciders on site at Curds and Wine, you will need to bring 2 pounds of sugar the day you start your cider. Munton's cider kits require no additional ingredients. Contact us to make an appointment to start your cider kits with us!